← Feminist chants and signs for events! 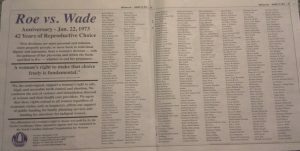 Every year, NC NOW runs a pro-choice signature ad filled with names of pro-choice North Carolinians from across the state. The ad runs to commemorate the anniversary of the Roe v. Wade decision that gave women control over their own bodies, and is a fundraiser for NC NOW. We also deliver copies of the ad with a letter from NC NOW on legislative priorities to all of the state legislators after the legislative session starts. We have been doing this every year for decades! Now more than ever, our legislators need to be reminded that they represent pro-choice women and men, and that we vote! If you’re pro-choice – put your name to it! Let them see it in black and white (and purple). If you want your name in the ad, please include how you want it to appear. The signature ad is NC NOW’s main fundraiser, so please make a donation. Names are due by Monday, Jan 16, 2017. If you want to use a credit card, you can either run it yourself online at pro-choice signature ad – 2017 or put the information in the attached pro-choice signature ad appeal letter and mail it in. If you want to send a check, please use the 2017 signature ad appeal letter. If you mail something in, you may also want to email president at raleighnow.org, in case something happens with the mail. If you do it yourself online then we never see your credit card number or anything, so that is the recommended way, but both ways work. Also if you do it online, please fill in the fields on the page so I get an email telling me who signed up. This entry was posted in abortion, clinic violence, reproductive rights and tagged abortion, health care, reproductive rights. Bookmark the permalink.